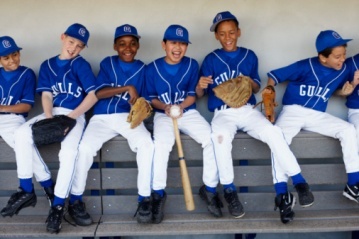 Youth baseball is booming in Delray Beach, Florida, but pre-teen children of local migrant farm workers remained on the sidelines until 2009, when 14-year-old Lewis Winter of nearby Boca Raton helped level the playing field by creating the Safe At Home Baseball program. Winter began Safe At Home to fulfill his community service requirement at Palm Beach County's Spanish River Community High School, but the program quickly grew into a community-wide resource. With donated equipment and a converted soccer field, Winter enlisted a few former major leaguers to help conduct practices and games with the migrant children, including some whose talent and dedication found them places in the local youth baseball program while their families remained in the area. With an opportunity to play, some of the migrant youngsters reportedly began dreaming of big-league careers. "It's a great thing," Winter told the South Florida Sun-Sentinel, because the migrant children "get a lot out of it, but I get a lot out of it" too. "I wanted other kids to have the same happy feeling"
Baseball and warm weather provides the backdrop for Lewis Winter's initiative, but the winter cold in the Buffalo, New York suburb of East Amherst enables ice hockey player Nicholas Penberthy to perform his acts of athletic generosity. After Nick and his family built a small backyard rink in 2007 and flooded it in anticipation of sub-freezing temperatures, the sophomore set up the first "Hasek's Heroes 3 vs. 3 Backyard Hockey Classic," a tournament for local high school players. Three-member teams entered, with their registration fees going to Hasek's Heroes, a foundation that former Buffalo Sabres goalie Dominik Hasek created in 2001 to provide hockey opportunities and educational support for children of low- to moderate-income inner-city families in the Buffalo area. The first annual Backyard Classic drew eight three-member teams and raised $500 to purchase hockey equipment. The following year, twelve teams raised $1500. The 2011 Classic, with nearly 100 players from various high schools competing at two backyard rinks, raised $6,100, including financial support from local sponsors. "This tournament has resulted in hundreds of inner city youth being introduced to" hockey, attests the executive director of Hasek's Heroes. Why the initiative? "My parents would buy me new equipment when I needed it. I wanted other kids to have the same happy feeling of putting on a new pair of hockey gloves, pants or skates," says Penberthy, who told msnbc.com that he hopes the tournament's growing popularity will continue to spread to backyard rinks throughout western New York. From coast to coast, hefty participation numbers in youth sports programs often hide the paradox that many financially-strapped families have fewer sports options for their children than ever before. As the cost of youth sports continues to rise, many families with tight budgets find themselves forced to make sacrifices to assure their children's participation, particularly in tough economic times. Even with sacrifice, however, children of the nation's least privileged families can easily fall through the cracks, overlooked and forgotten because exclusion may leave them uncounted and unnoticed. Financial barriers can place organized sports off-limits for many children from poor families, including migrant farm workers' children and many inner-city children, the two disadvantaged groups that Lewis Winter and Nick Penberthy sought to reach through the sports that their own families were able to provide for them. News accounts did not mention whether Winter or Penberthy were stars on their own teams, perhaps because their own athletic prowess did not matter. As psychologists Scott T. Allison and George R. Goethals write, "athletes' non-athletic behavior can be their most inspiring acts." Private and public youth sports programs may help some needy families overcome financial barriers by waiving fees and providing other needed support. Benefactors such as Hasek's Heroes may also open doors otherwise shut. Safe At Home and the Backyard Hockey Classic demonstrate that benefactors may include other youth leaguers themselves. Sources: Wayne K. Roustan, "Delray Teen Teaches Migrant Kids the Fundamentals", South Fla. Sun-Sentinel, Oct. 17, 2010 (Lewis Winters); Keith Latta, "A Lofty Goal: East Amherst Teen Scores Big With Backyard Hockey Tourney that Raises Money for Hasek's Heroes", Buffalo News, Jan. 13, 2011, at B5; "2011 'Backyard Classic' Ice Hockey Tournament Raises $6,100 for Buffalo Inner City Hockey Organization, Hasek's Heroes" (Mar. 8, 2011)(http://www.msnbc.msn.com/id/41970802 ); Scott T. Allison & George R. Goethals, Heroes: What They Do & Why We Need Them at p. 171 (2011).